When Away premiered at Griffin Theatre in January 1986 I was nineteen and just embarking on a career as a playwright. I’d been part of the inaugural Interplay Young Playwrights’ Festival six months earlier, and had recently begun my first theatre job as Shopfront Theatre’s playwright-in-residence. I clearly remember sitting in the audience with the growing awareness that this play was a game-changer. The bar had been raised. We baby playwrights were being shown that Australian plays could still be, as they had been hitherto, comic, political and broad to the point of caricature, and at the same time elegiac, lyrical, nuanced, superbly crafted, local while referencing a bigger world. Away both inspired and threw down the gauntlet. I wrote my first play, Conversations with Jesus, a few months later and upon reading it now, Away’s influence is immediately apparent. Conversations with Jesus revolved around the amphitheatre built at Balmoral Beach by Theosophists anticipating the Second Coming. Its characters were broadly Aussie (ten-year-old Kylie sang, ‘Hallelujah, leap from your beds! / The Saviour’s walking through the Heads’), and it combined whimsy, intergenerational bitterness, death, and tapdancing. While my own DNA as a playwright is apparent in that early play, I can’t help but wonder what it might have looked like without Away. Michael Gow was performing in King Lear (Nimrod, 1984) when he first began to conceive of the play – he admired Shakespeare’s refusal to be literal, his ability to transport the audience to any place or time. During the writing of Away he was playing Hamlet (Thalia Company,1986): it’s no wonder Shakespeare hovers over the play like a benign spirit. A Midsummer Night’s Dream features, of course: excerpted and quoted frequently, with its fairies wreaking havoc. Tom conjures a storm which, like that in The Tempest, acts as a catalyst for crisis and reconciliation. And the last word is Lear’s, as the old king divests himself of responsibilities in preparation for death. It’s interesting to note that while attempts have been made to adapt the play for the screen, none so far have succeeded, and I think this speaks to Away’s inherent theatricality. Its emotional power relies on the memories we bring to it of our own school plays, first loves, summer holidays. We project these onto the abstract space and our own lives intertwine with those of the characters. This meta-theatricality is of enduring significance to Gow’s writing. A look at his other work, especially his two most recent plays, Toy Symphony and Once in Royal David’s City, shows how the actual stuff of theatre, the elements that combine to make drama, intrigues him. He plays with them consciously, commenting on them, recruiting them to his service, inverting them. And while Away is about many things, to me it’s about the power of theatre to restore, to make right. This is what theatre can do – make the impossible possible, the unbelievable feasible. It has the ability to give words to the unspeakable. It lets us slip into other people’s lives and see the world from their perspective, engendering understanding and compassion. Its communal nature unites fractious relationships and fractured souls. Its very artifice is a device for telling the truth. Some plays are refined over years, the writer chiselling and revising. Others owe their power to having been written in a white heat, but after a long mental gestation period: such is Away. Peter Kingston, Griffin’s Artistic Director at the time, needed something to fill a slot for a show that had fallen through. 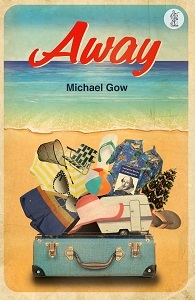 Gow proposed the idea of Away, then spent three weeks writing, starting with the end-of-year play and the packing scenes. Kingston liked what he saw, assembled a cast based on these scenes, and started rehearsals. Gow delivered the final draft just before the first dress rehearsal. And he told me recently that ‘there was virtually no rewriting, in fact the one and only typescript of the play is pretty much what Currency published’. It’s remarkable how fresh Michael Gow’s play, written nearly thirty years ago, still feels. In terms of both themes and dramaturgy, it could have been written yesterday. The young writer’s second play displays maturity, there’s a balance between passion and craft. It has a profound sense of assuredness and a lightness of touch. It’s also fascinating to look at the play in 2014, knowing that there were only eighteen years between its period setting and the time of writing – 1968 to 1986. The parents – Jim and Gwen, Vic and Harry – recall their own youth: the rubble of post-war London; the desperation of Depression-era Sydney. There’s a kind of leapfrogging from past to present – and beyond the writer’s control – to the future, that illustrates where we’ve come from and who we might become. So thirty years on, why is this play so enduring? Why is it perennially on the education syllabus, a favourite of amateur companies, consistently produced? Why is it considered an ‘Australian classic’? A classic is a play that speaks across the specifics of time and place, that still resonates decades (sometimes centuries) later, not because the world hasn’t changed, but because human nature hasn’t. This doesn’t mean that every ‘classic’ is able to be radically reinterpreted – Away relies on its Vietnam War period setting and beachy suburban Australianness – but even if one day we become a nation more compassionate towards those who aren’t ‘regulars’, as Gow’s campers call themselves, our human distrust of difference is unlikely to have vanished, and it is that which keeps Away relevant. In 2014, as in 1986, one cringes at the Campers’ sense of entitlement, their hostility towards newcomers. A classic is a work that is forever modern in its themes, and that is constructed in such a way that these themes unfold seamlessly before our eyes. Theatre opens our eyes, it wakes us up. The play’s third line, ‘That you have but slumbered here’, and later quoted by Roy, introduces the motif of awakening – to the facts; to one’s own truth – which threads through the action. Coral, with no other desire than to resurrect her lost son through Rick, reveals to him the life he’s unthinkingly chosen – ‘I feel like I’m asleep all the time’. Vic and Harry share their heartbreaking secret with Jim and Gwen – Gwen in particular is transformed, her eyes opened to how blessed she is, and in how much danger she’s been of destroying what matters most. And Tom awakens Coral, bringing her back to life by telling her of his imminent death. Theatricality is there in the writing’s playfulness, combining soliloquy, dumb show, dialogue, a Greek chorus of Campers, the literal with the fantastical. The most devastating drama – youth cut down – is juxtaposed with the silly and comedic. It’s important that the dark heart of the play is not overlooked in favour of the broad comedy. It is, after all, a play about death – of parents clinging to dead or dying sons; of a boy trying to reconcile himself with his brief measure of time. We are put through the emotional wringer, but are finally released through the act of theatre – Australian schoolkids speaking Shakespeare’s words. Theatre is again invoked through the little performances-within-the play, all significant moments. The school production of the Dream brings Tom and Meg together; it provokes Coral to tears (she is also able to see Tom’s mortality, though she doesn’t know it); it provides a background onto which the parents’ attitudes towards their children are in stark contrast: Harry and Vic’s pride in Tom; Gwen’s dissatisfaction and Jim’s ineffectualness. Then of course The Stranger on the Shore, Tom and Coral’s performance for Amateur Night, which allows Tom to relinquish his own hold on life and encourage others to embrace it. In all its crudeness and naïveté – or because of it – we are deeply moved: like the sailor, Tom uses his one wish not to ‘return to human life’ but to help others live. TOM: ‘Meantime we shall express our darker purpose. These weary words, spoken by the aging king and put in the mouth of a teenager, allow us to see life reconciled with its own brevity. The beginning of one play is the end of another. In a play that celebrates the power of theatre, form and content are beautifully interlaced. Gow balances epic forces – dark and light, life and death, rage and forgiveness – elegantly and even delicately, while pulling no emotional punches. The play speaks to primal anxieties – the loss of a child, of one’s own child – in a way that is at once stark, unsentimental, true, funny, affectionate and wise. The voice is unique, confident, distinctly Australian. It is beautifully structured, gradually moving through its five acts from indoors to outdoors, backstage via transformative beach to playground. The control over mood that this structure allows and the release of information is masterful. The writing is lyrical, both in terms of its visual images and the text. But the dialogue never feels ‘poetic’ or self-conscious and the characters’ voices are as individual as the people themselves. And importantly for a script, it has so much to offer its collaborators. What a gamut of possibilities the fairies’ tempest offers the director and design team, from a wind-machine and cardboard wings to dazzling pyrotechnics. ROY: You seen much of this country yet? How long have you been out here? VIC: Eight years. Not a lot of it, no, not yet. HARRY: Ohhh… no. Not exactly. We’ve got a tent. JIM: Oh, a tent. Terrific. I miss the old tent sometimes. GWEN: We’ve got a new caravan. Everything in it you could want. HARRY: It’s a small tent. We just put it up against the car. ROY: Well, we’ve got a plane to catch. The Gold Coast. GWEN: The Gold Coast… well. You’ll have a lovely time. Firstly, the tone. Comedic, spiky and with a touch of melancholy, the tone wrought in these few lines is consistent throughout the play. Exposition is disguised through Roy’s attempts to make conversation: we learn that Tom’s parents are immigrants. We also get an idea of everyone’s socio-economic stations. Character is revealed with every line – Gwen’s snobbery; Jim’s eagerness to make others comfortable; Roy’s authority; Harry’s humility; Vic’s warmth. Both women respond to Roy’s Gold Coast holiday with the same word, ‘lovely’, but context makes it clear that Vic’s is genuine and Gwen’s is grudging. Status, and how seriously each takes it, is deftly unfolded via the three modes of holiday – caravan trumping lean-to but being squashed by the Gold Coast (in a plane, no less). Gow is sparing with stage directions, but those he gives are important: two pages earlier, Gwen tipping out her handbag, that most intimate of receptacles, is a quite shocking act of aggression. It speaks volumes about her personality, her current mood, and the way she wields power over her family, whose response implies that it’s not unprecedented. In the script from the original production, and in the play’s published form, it is Tom who speaks the final lines. In 1992, for a production for Sydney Theatre Company, Gow revised the scene. In an interview, he said, ‘When I did the play in 1992 I asked myself a lot of questions such as – when Tom has done his play on the beach is his function over and is his reading of King Lear redundant? I decided to give the reading to Meg. Tom is there, but in another kind of present that’s all his own.’ (Murray Bramwell, Coming Home to Away). With the passage of time (and the benefit of seeing the play in production), Gow found a more dramaturgically economic, and an even more resonant way, to end the play. This divergence from the published version has caused consternation among some teachers. However, it must be remembered that a script is not an educational text, it’s a blueprint for a living, three-dimensional experience. Rather than posing a problem, the revision should instead be embraced as a point for discussion, an insight into the workings of the writer’s mind and the nature of writing for live performance. One final word about what constitutes a ‘classic’. A classic is capable of being open to a variety of interpretations. According to the zeitgeist of the times, or the politics of the director, or the experiences of the audience member, it can be about any number of ideas. Despite Away having clear themes, it will strike different notes for a parent, a refugee, someone newly bereaved, a child. What I take away, nearly thirty years after its first performance, is the play’s examination of theatre’s restorative powers, its ability to awaken. First published in 2014 by Currency Press as ‘Robin Shall Restore Amends’. HILARY BELL is a graduate of the National Institute of Dramatic Art (NIDA), the Australian Film, Television and Radio School (AFTRS), and the Julliard Playwrights’ Studio in New York. She is a member of playwrights’ company 7-On, and a recipient of the Philip Parsons Young Playwrights’ Award, Jill Blewitt Playwrights’ Award, Bug’n’Bub Award, Aurealis Award for Fiction, the Eric Kocher Playwrights’ Award, the 2007 Inscription Award and an AWGIE for Music Theatre. She was the 2003-04 Tennessee Williams Fellow in Creative Writing at the University of the South in Tennessee. Plays include Wolf Lullaby, Fortune, The Falls, The Anatomy Lesson of Doctor Ruysch, Shot While Dancing, Memmie Le Blanc, Open-Cut, The Mysteries: Genesis and The Splinter. Also, in 2012, Black Swan’s production of The White Divers of Broome premiered at the Perth International Arts Festival. Hilary has been resident at the Eugene O’Neill Playwrights’ Conference in the US, the Russian Playwrights’ Conference, and the Australian National Playwrights’ Conference. She is a director on the Griffin Board, part of State of Play’s artistic directorate, and on the artistic advisory panel for the Production Company, New York. Hilary was the winner of the 2013 Patrick White Playwrights’ Fellowship.